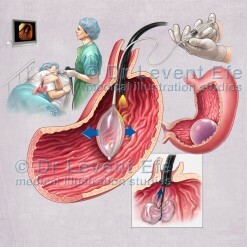 Medical artwork displaying Gastric cancer and Gastric ulcer. 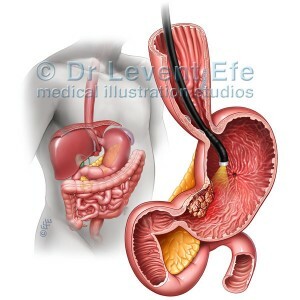 This anatomical image depicting the Digestive system within the human body as well as a Gastroscope inside the stomach is a perfect visual tool to educate patients about Stomach ulcer and cancer. SKU: GIT14. 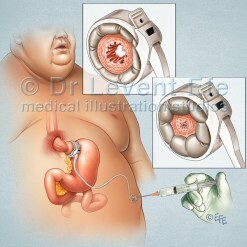 Category: Gastrointestinal (GIT). Tags: digestiveSystem, GastricUlcer, oesophagealVarices, oesophagus, stomach, stomachCancer, stomachUlcer, ulcer. 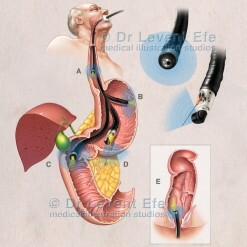 Cut-away medical illustration visualising in immaculate detail how Stomach ulcers and cancers are viewed by Endoscopy. 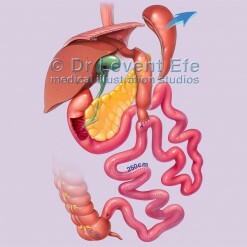 Neighbouring organs like Liver, Spleen, Large intestine and Pancreas are illustrated in the Digestive system inset to depict likely targets of metastasis. 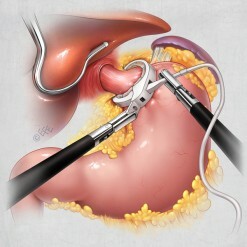 The Anatomically accurate and visually pleasing image helps health care professionals explain patients all facts about Stomach cancer.